Poor Japanese in an English text, as opposed to Engrish. What is Japlish? Is the term apt? Terms of Japanese origin are now used by western players as quasi-English terms, but either with different meanings from Japanese (e.g. yose, fuseki) or with a different range of coverage, e.g. hane, sagari. Some Japlish terms are in widespread use in English, and have a different connotations and associations. Some may even have a well-defined specific meaning, different to the meaning when used in Japanese (to discover these is, for now, left as an exercise for the deshi). Japlish terms can obviously lead to confusion. It helps to mark them as such. 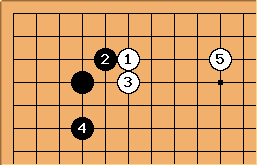 John F. Yose is used in English to mean endgame; In Japanese it refers to the drawing together of territory boundaries which often happens much earlier in the game - my earliest record of a yose comment is move 68. Bill: That is not to say that Japanese go players do not use yose to mean endgame, as well. In fact, my Kenkyusha's New Pocket Japanese-English Dictionary gives this definition of yose: "the last (concluding) moves". John F. Fuseki is used in English to mean opening; in Japanese it means a specific type of opening - the spreading out of stones. A 50-move joseki maul in one corner is an opening but not a fuseki. Bill: Again, it is not as though the Japanese do not use fuseki to mean opening. Kenkyusha's New Pocket Japanese-English Dictionary gives the following definition of fuseki: "preliminary moves". See sagari, hanezeki and kadoban. Bob Myers I would disagree that either yose or fuseki is used differently in English and in Japanese. In either language, yose refers to the stage of the game where territory delineations are refined, and/or moves of a size below a certain threshold, perhaps 20+ points, are made. Perhaps the problem is in the translation of yose as "endgame", which in English does indeed have the nuance of a short stage right at the end of the game, whereas as John F. correctly points out, yose could start after only several dozen moves in some cases, and possibly continue for much longer than the pre-yose stage. If some English speakers mistakenly use the word yose to refer instead to a chess-like endgame concept, they're simply using the word wrong. Probably a good argument for using the Japanese word in this case. 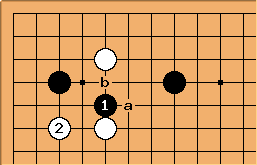 Concerning fuseki, I've never encountered English speakers using this to refer to the opening in the sense of a long single-corner joseki sequence. As far as I am aware, they use it in the same way it's used in Japan, namely to refer to the initial phase of the game and the whole-board placement of stones during that phase. Moving on to hane and its variations, it would be unusual (one could say wrong) for an English speaker to use hane when hanekomi is meant. With hanekomi, an essential characteristic of the move is the wedging in aspect. Hanedashi, on the other hand, simply refers to a particular type of hane. In either Japanese or English, it would be correct to refer to a hanedashi simply as hane; the term hanedashi could be used to provide more information about the move in its context if desired. gimpf: Just about the endgame/yose: Isn't there an agreement about referring to early/middle/late endgame if it's necessary? And since we are all (more or less) go-players here, is there really this strong misunderstanding about the term endgame? John F. Bob, I'm very surprised that you say you are unaware of players using yose for endgame and fuseki for opening. Maybe the Americans have had a different tradition, but for example in the glossary that has appeared for many years in every issue of the British Go Journal and is still there, the following complete definitions appear: (1) yose: the endgame; (2) fuseki: the opening phase of the game. But I've come across the usage many times elsewhere, so I wonder if this usage passed you by while you learnt go unsullied in Japan? Bob Myers Perhaps I was misreading this discussion. I initially interpreted the gist here as being that Japanese words such as yose have a generally agreed-upon meaning when used in English that is different than their meaning in Japanese. I was trying to make the point that in fact, when used correctly, yose in English and yose in Japanese have the same meaning, that people who use them with a bastardized English meaning are doing so incorrectly, and that in fact that incorrect meaning is not "generally agreed-upon". I agree that there are players who use the terms incorrectly, as John F. points out. So I guess the point of this page, I now realize, is to call people's attention to these incorrect usages and attempt to correct them? In that case, should the first sentence under "Explanation" above maybe be something like "Many terms of Japanese origin are now used in English, but some western players use some of these terms incorrectly..."? mAsterdam (In humble non-native almost-English): Like so? dnerra All the pages that I looked used sagari in the sense of "descent to edge". Maybe you should just accept that this is the English meaning of sagari, and we should explain it in this way on the sagari page. unkx80: I am not too sure. A couple of them seem to be used in the sense of "blocking on the first line". Please tell me if I am wrong. dnerra Well I only looked at a few of them, and they were consistent with the meaning I mention above. For the record, the British Go Journal Glossary defines Sagari as "A descent towards the edge of the board from the second or third line." And "translate sagari" on IGS interestingly lists "sagari kiri" as one japanese explanation, and the example also is a descent to the first line. I still stand by my suggestion. John F. I am obviously failing to get my points over. Let me try again. I am not specially disagreeing with what you are saying. I am trying to go beyond it. A move from the second to the first line CAN be a sagari, but Japanese people have a wider choice of terms, or ways of modifying a term. They will therefore normally use orikiri for a first-line move, and I would go so far as to say will always use it for a tesuji (which is what was being illustrated). The -kiri ending is just too appealing and normal for them - the usage is a bit like the adverbs we tag so freely on verbs in English (eat up instead of eat). So my Point 1 was that the example given of a sagari tesuji was, in practice, not likely to be called sagari in Japan. My second, more important and general point was that it is highly desirable to give your sources, so that people know whether you are (knowledgeably) adding a pure Japanese term, or a once-Japanese term that is now used/misused/abused in English. I think it is often forgotten on SL that the definitions are being offered for those who come later, not the friends who know us and know what we really mean. For the record, in conversation I will readily use sagari in its catch-all meaning and would never say orikiri. But a reference medium shouldn't be so lax. I was horrified at the idea of anyone quoting the BGJ glossary, by the way. dnerra I understood that you were not objecting to using "Japlish" terms in case they were marked as such. I was partly responding to what I found an overly hasty renaming of the Sagari page to descent page etc. About giving sources etc. : Well, as I said, I was mostly trying to illustrate this tesuji, and cared about it's name only in so far as this helps to remember the tesuji, and to give it a place in SL. So I simply didn't care enough for terminology to look for sources (not that I would have had any). unkx80: Thanks John F. for the explanation. hnishy: Nowadays, orikiri is increasingly rare, sagarikiri still rarer. The most usual expressions are "issen no sagari" (to the first line), "nisen no sagari" (to the second line) etc. mAsterdam: Some Japlish in the making: Until moved from [Tsuke-tobi joseki]. JF Diags 2 is a bad joke. Such usage is ungrammatical, and even though the term can fit Diag 1 it reeks of being another joke. Who's the prankster? Bill: is tsuke, is tobi. Besides, it's joseki. What's the problem? JF (1) I don't think tsuketobi is in the normal go lexicon; (2) you can't change the subject of the two verb forms in mid stream. The tsuke and tobi must be by the same player in all normal circumstances. (3) It seemed to me that using irregular Japanese, when perhaps we shouldn't really be using Japanese at all, was a leg-pull, not least because no name was attached. Maybe I over-reacted - apologies if so. Bill: Re: (1) Absolutely not. (2) I'll trust you on Japanese compound formation. JF I'm still curious who first introduced the term here: suspiciously similar to the one term everyone seems to know, tsukenobi. unkx80: Isn't the term "Japlish" referring to poor English spoken by some Japanese, or the other way round? Velobici: Perhaps it would be Enggo (from English and Nihongo, Japanese for the language we call Japanese) not to be confused with Ing Go or even Eigo (from the Japanese for English and Nihongo) not to be confused with Igo. heather: The problem there is that the suffix -go in this context means "language" -- "Nihongo" is the Japanese language, "Rossiago" is the Russian language. "Enggo" simply suggests the English language. BuggyMind: Eihongo, perhaps? Btw, the Japanese term for a real mansion is 'okusion' – man = 10 000, oku = 100 000 000. John F. Spoof Japanese is not new, and I was trying to dig into my memory for examples. Can anyone remember any? The only one I can remember is from shogi: the player Mukinaka (as in Mukinaka's Joseki), and there were some spoofs on Anaguma (Bear in the Hole). I also had a friend who watched the shogi programs in Japan and tried to convince people there was a popular player called Harry Mashita. Then there was the famous Tuttle book by Ohara, who called Amano Heaven's Field, Ishida Stone's Field, and so on. That led to a lot of mickey-taking. But - BUT - the go ones escape me completely (though I think I can remember the perpetrators!). There was a BGJ with some examples of spoofs but I can't remember if they involved Japanese. One was something like an ad for Mathematical Rules of Go in 1,000 volumes by Jim Bates. It was alleged that someone in Europe tried to order it. (This was in London Go Centre days - showing my age!) All this subject to not having jumped to the wrong conclusion about this page, of course, but a page devoted to spoofs seems a good idea. Charles All very droll, doubtless. ilanpi http://www.urbandictionary.com/define.php?term=J.A.P. I think I got booted from KGS for this.